In commercial installations of 50‑ohm cell signal amplifier systems, your best choice for connecting indoor antennas is to use ½‑inch plenum air coax. Commercial building codes typically require the use of fire-rated cable in plenum spaces (areas used HVAC air circulation, like those above a drop ceiling or under a raised floor). Plenum air cable is jacketed with fire-retardant plastic and is designed to reduce toxic fumes during a fire. 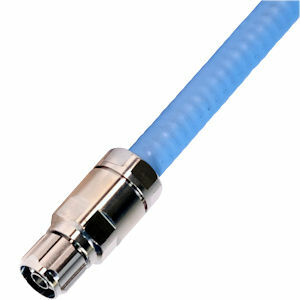 Plenum air coax also has extremely low signal loss (nearly half that of 400‑type cable), providing better performance and allowing for longer cable runs. Even if your building codes do not require plenum cable, choosing plenum air will give you the strongest possible signal in your office or other large building.